On January 21, 2014, President Xi Jinping met with Prime Minister Mikhail Myasnikovich of the Republic of Belarus at the Great Hall of the People. Xi Jinping said to Mikhail Myasnikovich, you are one of the highest-ranked foreign friends of China who have received the "Friendship Award" of the Chinese government. I highly appreciate for your important contributions over the years to China-Belarus friendly cooperation. Xi Jinping noted, for the 22 years since the establishment of China-Belarus diplomatic relationship, the bilateral relations have always maintained healthy development. Last year, together with President Alexander Lukashenko, we announced the establishment of China-Belarus comprehensive strategic partnership. It marks a new level of development of bilateral relations. Both sides should well implement the development plan of the bilateral comprehensive strategic partnership, will firmly support each other on the issues concerning each other's core interests and of each other's major concern, and by establishing mechanism of Vice-Prime-Ministerial inter-governmental cooperation committee, will make overall planning to promote bilateral cooperation in China-Belarus Industrial Park, high technology, finance, communications and transportations, and other fields, and will keep close cooperation in international and regional affairs. Xi Jinping stressed, we have kept on moving forward on the road of socialism with the Chinese characteristics. Fundamentally, the reason is that we always adhere to the strong leadership of the Communist Party of China, follow the development path conform to our national conditions, and unceasingly promote reform and opening up and carry forward the excellent traditional values of the Chinese nation. The Communist Party of China is the party that governs for the people, and people's happiness is our highest political goal. The Communist Party of China is leading the Chinese people striving to realize the goal of a great rejuvenation of the Chinese nation. We are willing to communicate with Belarus and learn from each other’s governance experience, and join hands with people from different countries to jointly promote the world peace, development and prosperity. 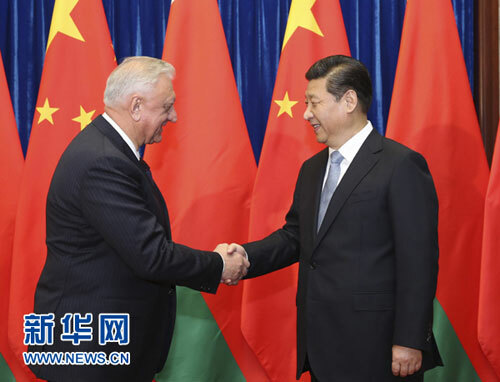 Mikhail Myasnikovich spoke highly of Belarus-China friendly cooperative relations. He expressed that Belarus admires China's remarkable achievements, believes that the Chinese dream is connected with the dreams of other peoples around the world to pursue a better life, and sincerely wishes that the Chinese people realize the Chinese dream under the leadership of the Communist Party of China, making a greater contribution to the cause of world peace and human progress. Belarus is also committed to reform and opening up, and hopes to learn from China’s successful experience and to strengthen high-level exchanges and practical cooperation between the two countries. Belarus firmly supports China in major issues concerning China's sovereignty and territorial integrity, and is willing to join the efforts with China to work for a more rational and fair international order.